Forget hotels. Get a Disneyworld Timeshare Rental. Why get a Disneyworld timeshare rental? Because you've been planning your Disneyworld vacation for a long time. You want everything to be perfect. As a timeshare owner, I have access to Worldmark Orlando, a fabulous, spacious hotel alternative. It's about a 20-minute drive from Disneyworld. Where is the Worldmark Orlando? Where is the Disneyworld timeshare rental? What else is there to do in Orlando while staying at the Disneyworld timeshare rental? Orlando is most famous for Disneyworld, but there is plenty else to do! 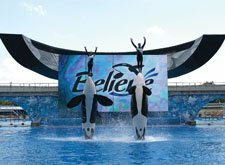 Sea World Orlando is about a three mile drive north from the timeshare. Nothing compared to watching the huge, slick Shamus jumping from the water at astounding heights! Universal Studio Orlando is just a few miles past that, a seven mile drive north of the timeshare. Go behind the scenes of your favorite shows and be part of the action! And of course, no vacation is complete without some shopping! Just a mile and a half west of the timeshare rental are the Orlando Premium Outlets. What restaurants are near the Disneyworld timeshare rental? There are a number of great restaurants near the Worldmark Orlando, especially near the Orlando Premium Outlets, just about a mile and a half west of the resort. On International Drive, just before the turn off on Vineland, you'll find The Vault at Hard Rock and Friendly's Ice Cream. Just a little further east, you'll find the Benihana Japanese Steakhouse on the right at 12690 International Drive. Turn right onto Vineland and you'll quickly see Tokyo Sushi, Q'Kenan, and Citrus Garden all in the row on the right. You can reach the Publix grocery store by taking the very next right, and Outback Steakhouse by taking the second right. Continuing on Vineland, you'll see McDonald's on your right, and right across the street are the Outlets! What is the Disneyworld timeshare rental like? What's not to love about a resort that puts you close to the action from Walt Disney World, Sea World, and Universal Studios? Add friendly staff, peace and quiet, and large rooms, and you've got yourself the perfect getaway. When staying at Worldmark Orlando (aka Kingstown Reef), many guests remark that the rooms are larger than they thought they would be from the pictures! ...and definitely larger than hotel rooms. All units have kitchens, though the kitchens in the one bedroom units are smaller than the kitchens in the larger units. The Publix grocery store is just about a mile down the road. Many families enjoy being able to load up with groceries in order to save money on eating out. But if you want to eat out, there are many restaurants nearby too! 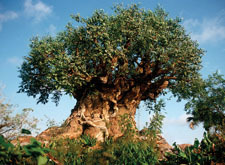 WorldMark Orlando has a shuttle to take you to Disney World and pick you up again. They make two trips to Disney World in the morning, and two return trips in the evening. As of this writing, they charge $10 per person, roundtrip. What are the rooms like at the Disneyworld timeshare rental? 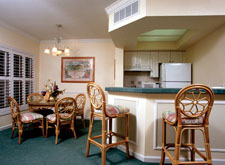 Worldmark Orlando has many different unit sizes to accommodate most parties. If you have an large party, consider renting multiple units. 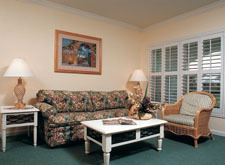 If someone in your party would like an ADA-compliant unit, take a look at Worldmark Orlando' Special Needs units. If your desired unit is not available, but a special needs unit is, of course I will let you know! Three Bedroom: King-sized bed in the master bedroom, another king in second, plus two full beds in third bedroom, and a sleeper sofa in living area. Maximum occupancy 8. Two Bedroom Fractional: King-sized bed in the master bedroom, two full beds in the second bedroom, plus a sleeper sofa in living area. Maximum occupancy 6. Two Bedroom: King-sized bed in the master bedroom, a queen-sized bed in second bedroom, and sleeper sofa in living area. Maximum occupancy 6. 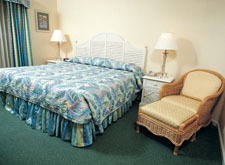 Two Bedroom: King-sized bed in the master bedroom, two full beds in second bedroom, plus a sleeper sofa in living area. Maximum occupancy 6. One Bedroom: King-sized bed in the master bedroom, plus a sleeper sofa in living area. Maximum occupancy 4. One Bedroom Fractional: This unit has a king-sized bed in the master bedroom and a queen-sized sofa bed in the living room. This unit will sleep a maximum of 4. Two Bedroom - Special Needs: A king-sized bed in the master bedroom, a queen-sized bed in the second bedroom, and a sleeper sofa in living area. Roll-in shower in some units. Maximum occupancy 6. Two Bedroom - Special Needs: King-sized bed in the master bedroom, two full beds in second bedroom, plus a sleeper sofa in living area. Roll-in shower in some units. Maximum occupancy 6. One Bedroom - Special Needs: King-sized bed in the master bedroom, and sleeper sofa in living area. Roll-in shower in some units. Maximum occupancy 4. How much will it cost to rent the Disneyworld timeshare rental? 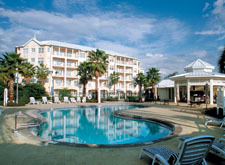 The Disneyworld timeshare rental is popular year-round; all dates are considered to be in the High Season. Rates vary according to the unit size, and according to which days of the week that you're there. Want to read what others have said about staying at the WorldMark Orlando? 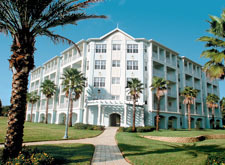 Read WorldMark Orlando Reviews. Winner: Best Resort for Children: As Mickeys East Coast headquarters - as well as home to Universal Studios and SeaWorld - Orlando easily topped the list of best destinations for kids. But this playground in the center of the Sunshine State caters to all ages, and WorldMarks Key West-styled property is just minutes from the entrance to the Walt Disney World Resort. Please note: The further out you plan your Anaheim vacation, the greater likihood that your dates will be available!